Hey! It’s the 5th day of December and my true love said to me: Make me Christmas Cookies! One a day please! Twist my arm! Introducing the 20 Days of Holiday Treats! One treat a day, all the way up till Christmas. hurrah! That means lots of baking for me and lots of eating sweets for my coworkers and any one’s address I can get a hold of. I’ll try to throw in gift and wrapping ideas too. So here we go… Day 1! 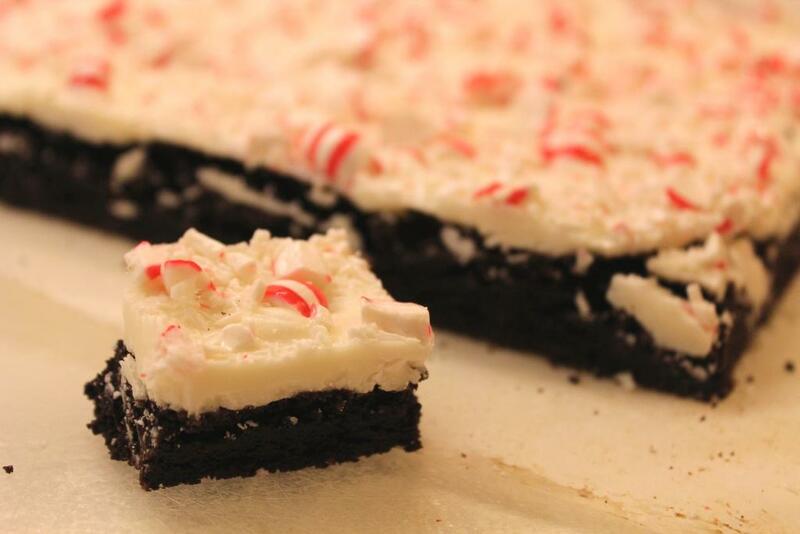 Espresso White Chocolate Peppermint Brownies. The espresso brings out the chocolate and the white chocolate melts in your mouth with an awesome crunch of peppermint. Probably my absolute favorite combo during the holidays. I used a new one that I really like from King Arthur Flour Cookie Company. The Cocoa Browned Butter Brownies I have on my blog would also be delicious for this and put a slightly different spin on the flavors. Just be sure to not use a brownie that has a crinkly top or the topping will become part of the white chocolate as you spread it. Line the baking dish with parchment or foil so it’s easy to pull them out of the pan for no brainer brownie cutting. 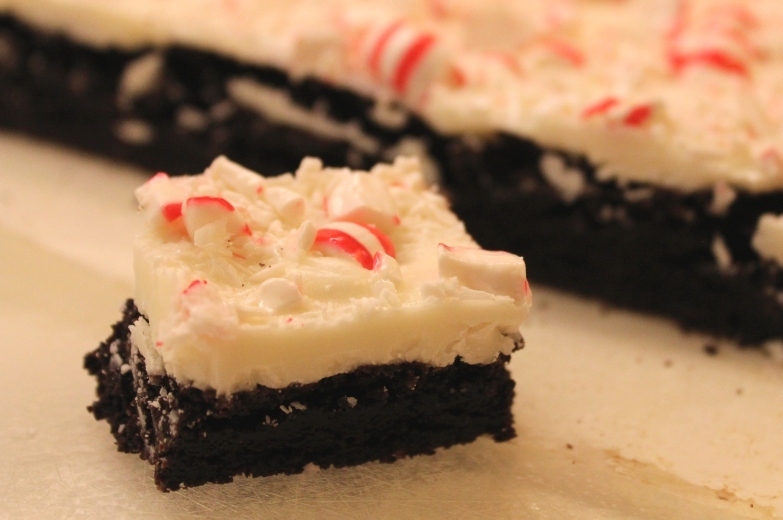 While the brownies bake, chop up some white chocolate and crush some peppermints. You’ll need about 2 cups of white chocolate and 1 cup of crushed peppermints. I used blocks of white chocolate from Target that are made specifically to melt. You could also use white chocolate chips, the baking bars, or just a big hunk of chocolate. As soon as the brownies come out of the oven, sprinkle the white chocolate on top. Let it sit for a minute or two. Then spread it across the top and sprinkle on the crushed peppermints. Stick in the fridge to harden. Once cooled, lift the brownies out of the pan and trim off the edges. Then cut into desired size pieces. I LOVE how the chocolate breaks a little bit as you cut it. Looks like snow capped mountains. yumm. Brownie recipe adapted from King Arthur Flour Cookie Companion. Preheat oven to 325 degrees and line a 9 x 13 pan with parchment paper or foil. Lightly grease. In a medium sized bowl, melt the butter. Add the sugar and stir to combine, dissolving the sugar. Stir in the cocoa, salt, baking powder, vanilla, and espresso powder. Whisk in the eggs until smooth. 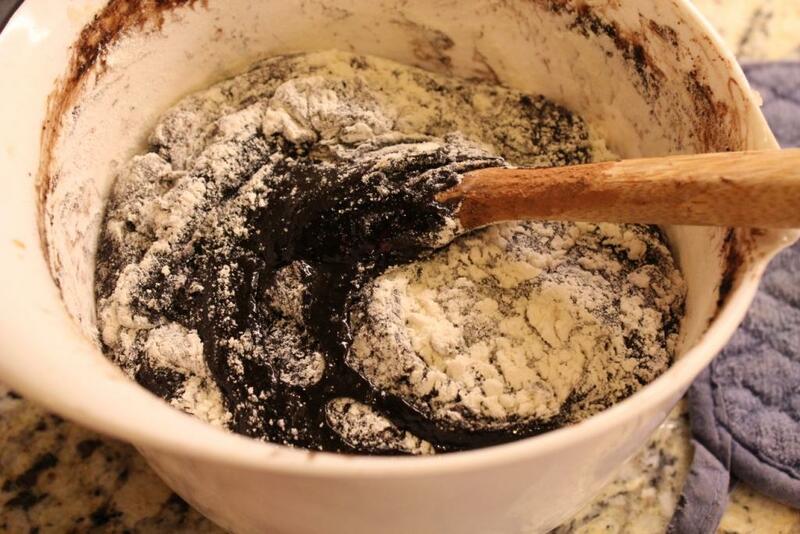 Stir in the flour and mini chocolate chips. Pour batter into prepared pan and bake 29 to 32 minutes. 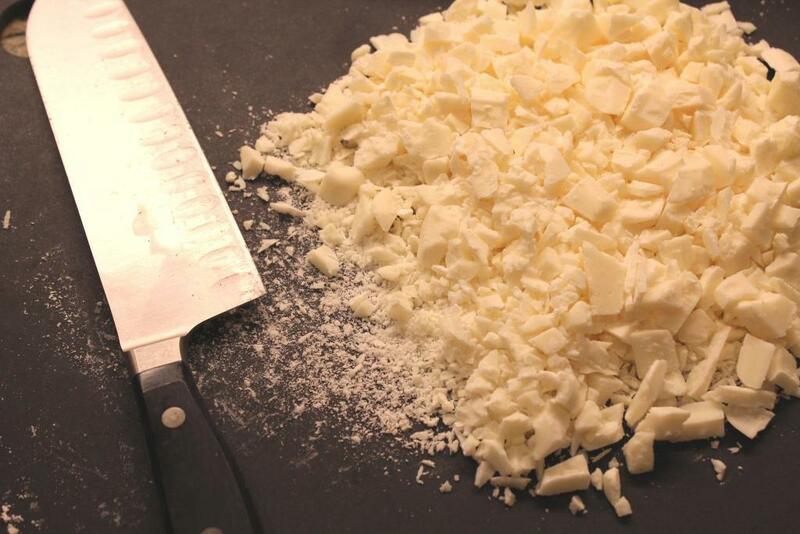 Meanwhile, chop up the white chocolate (if needed) and crush some peppermints. Remove brownies from the oven when a toothpick inserted in the middle comes out clean or with only a few crumbs attached. 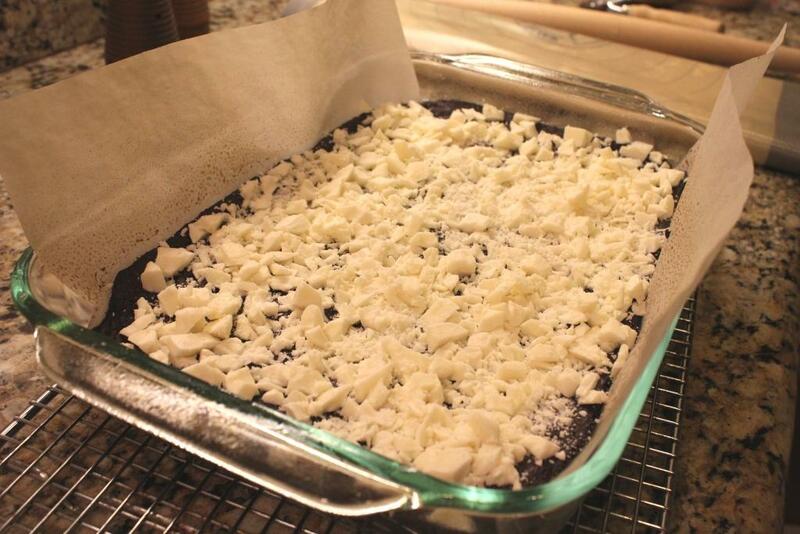 Set the brownies on a cooling rack and sprinkle chopped white chocolate on top. Wait a couple of minutes to allow the chocolate to melt then spread evenly across the top. 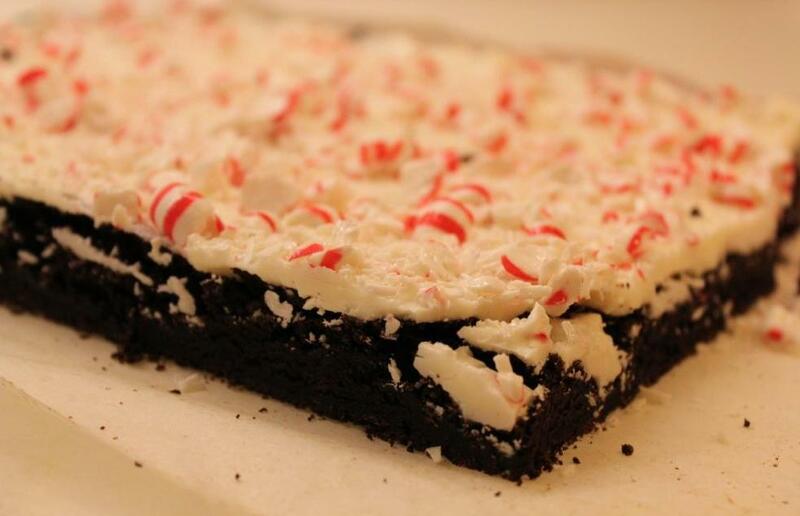 Sprinkle crushed peppermints across the melted chocolate. Allow to cool, and then move to the refrigerator to harden the top. When ready to eat, remove from the pan using the parchment paper or foil and place on a cutting board. Cut off the edges and then divide into desired size pieces. Hey Molly! These brownies look amazing! He must be one happy guy right now. So happy you got the cookies and I hope they arrived in one piece 🙂 20 days of holiday treats is a great idea. Can’t wait to see the rest of your posts and enjoy more of your blog now that you know who I am! So happy to meet you. Have a wonderful holiday and thanks for letting me know you got the package.